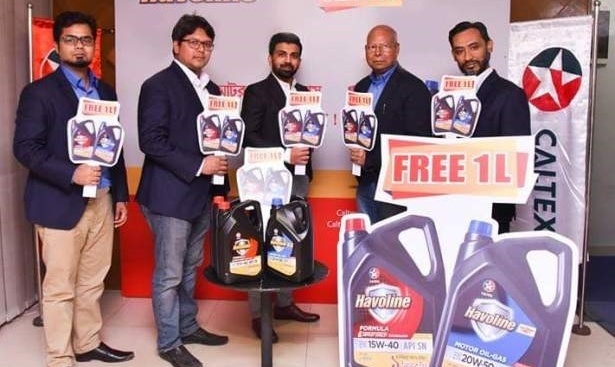 Navana Petroleum Limited, Markets Chevron Lubricants in Bangladesh unveiled the new, sleek and attractive “Havoline Formula” & “Motor Oil-GAS” Engine Oil, 5L Pack @ 4L Price, Free 1 Liter Offer, a press release said. The launch of the new “Havoline Formula” & “Motor Oil-GAS Engine Oil” was organized at an impressive arrangement in their Corporate Head Office. Mr. Shahedul Islam, Director of Navana Group & Mr. Faisul A. Chowdhury, Country Director with Company’s Business Heads were present in this ceremony. During the product promotion launching Mr, Faisul A. Chowdhury country director said that this two new packs are launched considering growing market demand of premium quality lubricants for both octane / petrol & CNG/LPG driven vehicles. Havoline Formula 15W40 is the most premium API SN grade engine oil for octane / petrol driven vehicles and Havoline Motor oil gas 20W50 is made-up of a balanced formulation for Gas/ LPG driven vehicles for best performance, longer engine life and economics. During the promotion time both these products will be available in 5-liter packs at 4-liter price and consumer shall get one liter free inside which is equivalent to 25% discount to user, according to the press release.